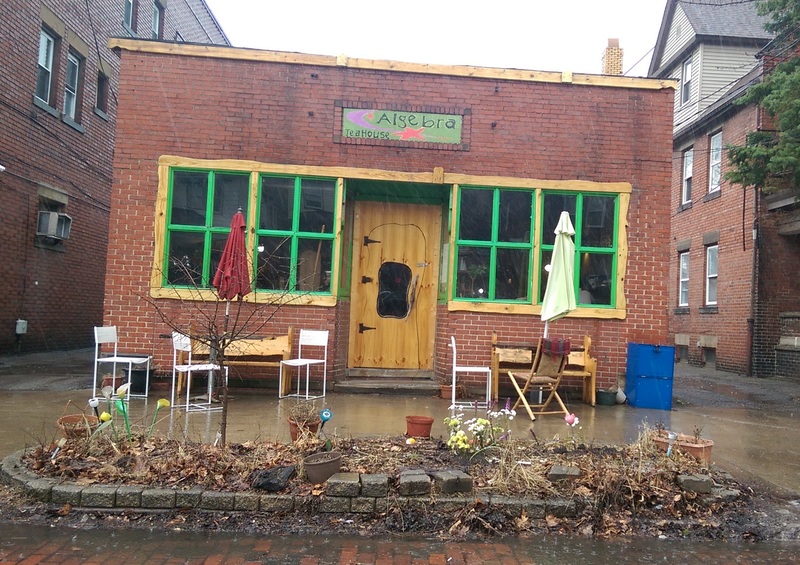 Algebra Tea House is an eclectic tea shop in Little Italy that serves beverages such as tea, coffee, smoothies and shakes, plus Middle Eastern cuisine (the owner was born in Pakistan and his family lived in Syria, Kuwait, Tripoli and Libya – he also lived in Austria for a while). The cafe is also very vegan friendly and has a large assortment of healthy menu options. Owner Ayman Alkayali is an artist and a businessman, and he created all of the eclectic cups in the shop. He also appears to enjoy woodworking and hates straight lines if the door and the shelving units are anything to go by. The front door, tables and shelves were hand-crafted by Ayman, and his paintings cover the walls. 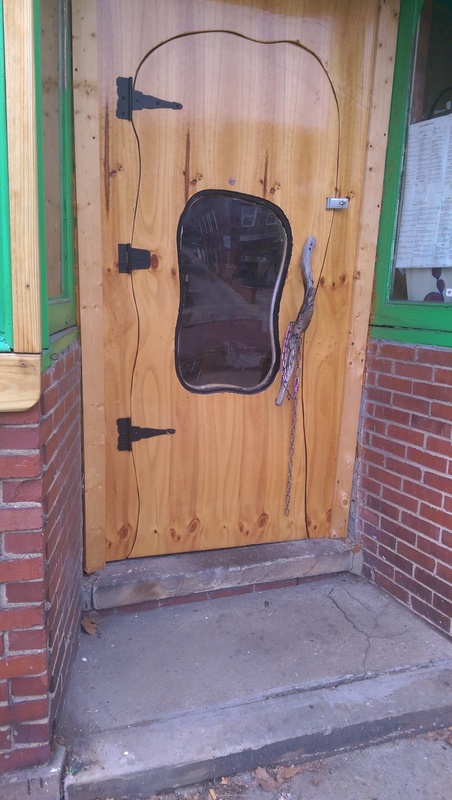 He put a lot of work into creating the shop from a bike shop with no gas or electricity. Algebra Tea House opened its doors in August 2001. It was the first non-Italian establishment in the Little Italy neighborhood. Algebra is opened everyday from 9am – 11pm. They serve breakfast specials on Saturday and Sunday alongside the regular menu from 9 am – 1 pm. Even though he is Muslim you can smell the bacon in the air on the weekends. The smell of Middle Eastern spices also blends with citrus from the orange peel resting atop a wood burning stove. Do not come here if you are in a hurry. Most of the time, there is only one employee working and they can only do so much. This is a place to linger and relax. There is even Bedoun seating around a low table. 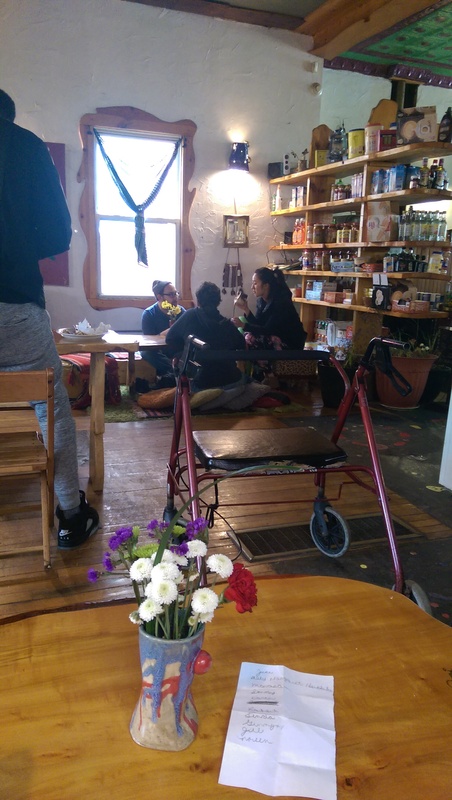 My knee would never cooperate with that, so I was also happy to see higher tables and chairs (there’s even a large couch). He designed Algebra to be a place for people to commune t ogether. There is a selection of games in the back to play with and a book exchange library on the front right wall. The first time I was here was in 2010 or 2011. I met a group of tea drinkers here and had a wonderful afternoon getting to know a lot of interesting ladies. In fact, I met a lifelong friend that day (Hi, G!). I was last here on a Saturday, and it took an hour and a half to get the tea and kebab I ordered. I have to admit that was a little frustrating, because it shouldn’t take an hour and a half to make a tea. I probably would have ordered a second or third one to go with my food if they hadn’t waited to serve the tea with my food. The server did offer the table half a House Smoothie (a vegan smoothie with mango, strawberry and banana blended with rosewater), which I grabbed since they had all been served their food at that point. It was very refreshing! I’d definitely order it next time. They had three people behind the counter (one just doing the dishes) and were obviously in the weeds, so I do plan on giving them a third chance during the week some time. You order at the counter, and they (eventually) bring your drinks and food to the table. You pay when you leave. I was there that Saturday with my tea group, so I was feeling more adventurous than ordering a straight Darjeeling or Orange Pekoe tea. The menu had a very wide selection of black, green, white, and ethnic teas as well as chais and “comfort blends” (basically spiced milks). Where else will you find hot chocolate made with chocolate, steamed milk, and rosewater? They also have a large selection of house roasted coffees. I decided to get the Friday Market Libyan Tea, which features black tea, roasted peanuts, mint and brown sugar. I was intrigued. It was the wildest yet one of the most delicious teas I have ever enjoyed. The mint was floating on the surface along with a good amount of roasted peanuts. The brown sugar meant I didn’t need to add any sugar. It was perfect just as it is. I also had the Moroccan Mint because my friend ordered me the wrong tea, but it was also lovely with fresh mint leaves. I had wanted to try their special tea that day, a green tea with mint cinnamon, but she must have misunderstood me when I asked. 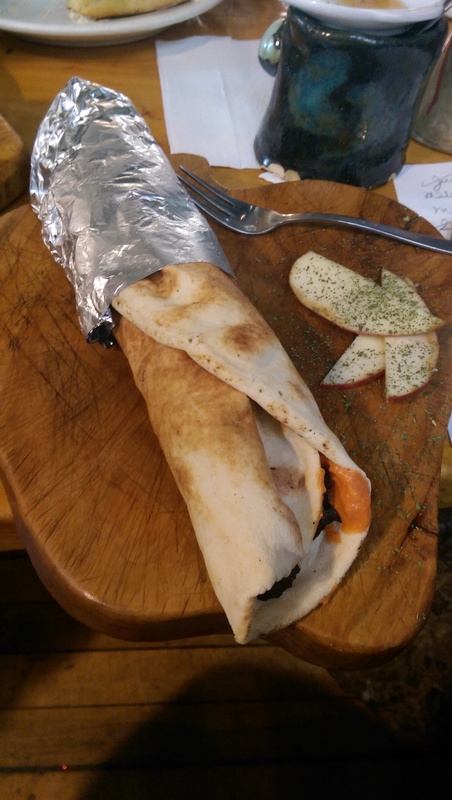 I also ordered the Iraqi kebab, which is made of ground beef and lamb mixed with garlic, parsley, sumac and Palestinian spices and wrapped with fresh vegetables, hummus, harissa and a yogurt mint sauce in a homemade pita. I really enjoyed it. It was obviously fresh and was very flavorful. It definitely hit the spot. Other choices include numerous salads and a falafal sandwich, shawarma sandwich, hummus sandwich, “Zoho gyro,” Cajun chicken sandwich, smoked turkey sandwich with zattar, and bagel sandwich. There are also various “plates” featuring fool madams, falafal, hummus, eggplant, labneh, sardines, or Syrian tomatoes as well as several “all day breakfast choices” that include shakshuka (Shak-shooka), a Saudi breakfast of carmelized onions, sauteed tomatoes and scrambled eggs with a side of warm pita. I’m familiar with the Israeli version. Another fellow diner had the spinach pie plate and loved it. The prices are affordable to appeal to the college crowd. 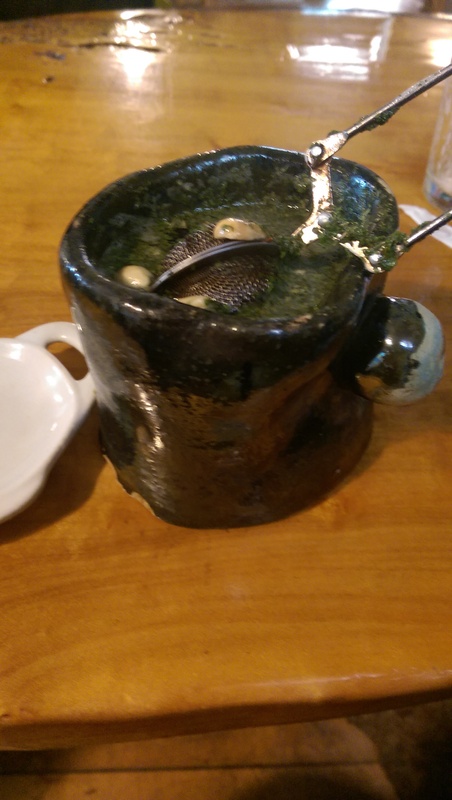 One of the people in the group who was a regular ordered the red lentil soup, and it came out piping hot in one of the coolest bowls I have ever seen. It’s round shape was intriguing, and the metal probably kept it hot for longer than a regular bowl would. 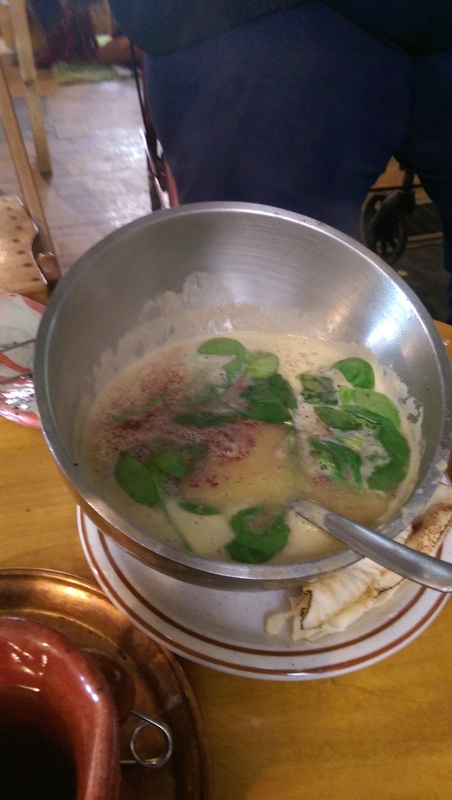 The soup had fresh spinach floating on top and looked delicious. He enjoyed the soup very much. Algebra is known for its hummus. The owner soaks large amounts of chickpeas overnight and makes big batches in an industrial-sized food processor. I know because I watched him grab the food processor from the shelf next to where I was sitting and pile in chick peas until they were almost overflowing out of the container. 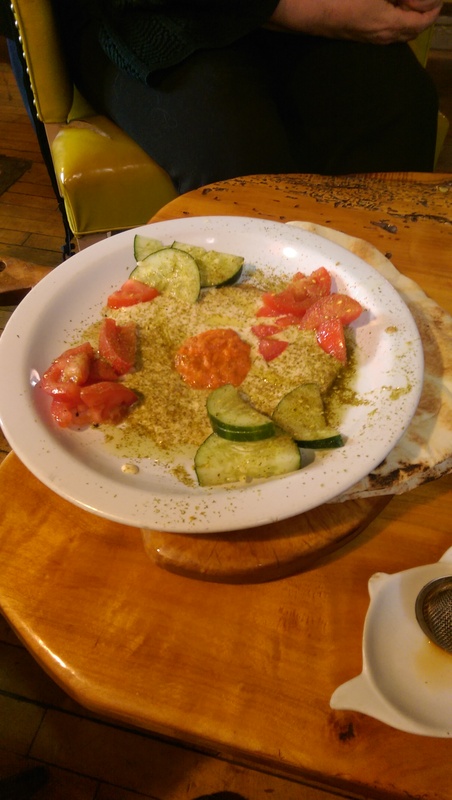 The hummus is smooth and creamy, drizzled with olive oil and dollops of what looks like a red pepper tapenade (but it could also be harissa), garnished with cucumber and tomato, and sprinkled with a mixture of spices on top. The desserts also sound amazing. The Banana Algebra, featuring sauteéd fruit with rosewater, cardamom, nutmeg and cinnamon, served over ice cream, sounds amazing. As does the Chocolate Chip Deli, homemade chocolate chip cookies topped with wildberry ice cream, bananas, whipped cream, cherry and nutmeg. The desserts all feature some kind of fruit and/or ice cream and sound healthy in addition to delicious. 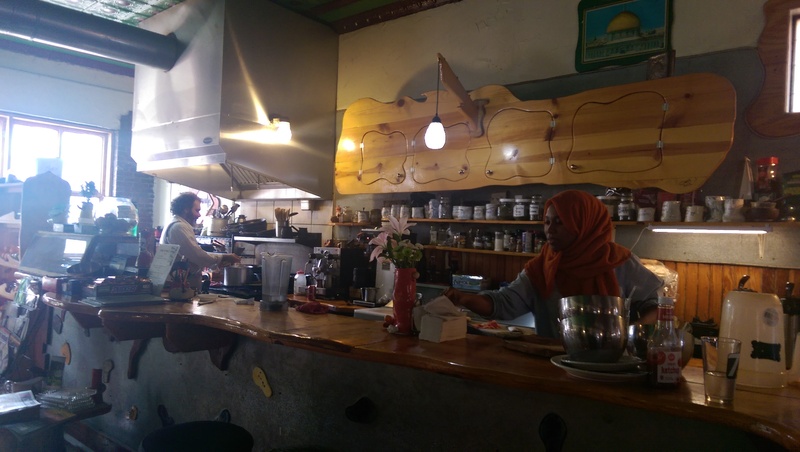 In short, this place features lots of Middle Eastern treats that appear to be all homemade. 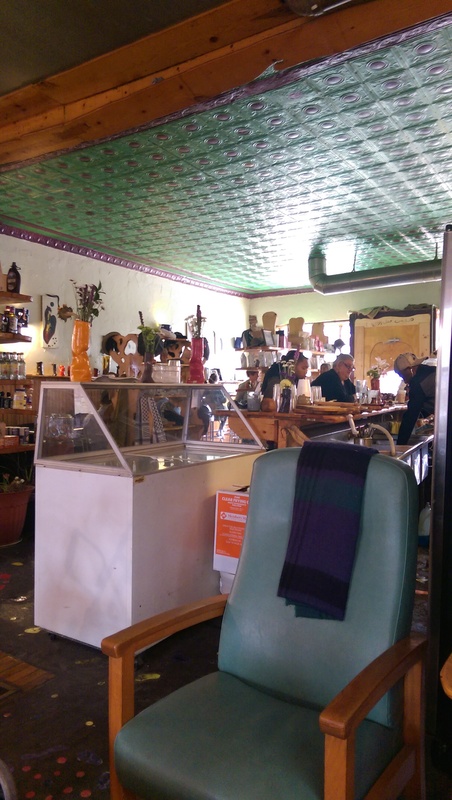 They have a wide choice of beverages and lots of vegan-friendly items. You can also buy loose leaf tea to make at home as well as a variety of grocery items.